If you are looking for information on the Juice Heaven franchise business opportunity, Juice Heaven franchises or Juice Heaven franchising, then you have come to the right place. taste and time is our mission. At Juice Heaven we serve a fast healthy alternative meal™ to accommodate the high-paced lifestyles of our consumers. We pack our smoothies and freshly squeezed juices with the finest ingredients. We do not add any sugar or sweeteners to our products. Our customers know exactly what goes into each one of our made-to-order smoothies and freshly squeezed juices. One of the most important criteria of any retail establishment is location. For the store to be a success, certain location characteristics must be met. 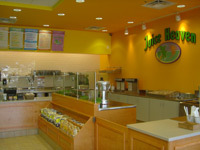 Juice Heaven franchisees obtain our experience and on-going support until the right location has been selected. Franchisees will then be guided throughout the lease negotiation to assure that their rights have been protected. We have devoted extensive financial and human resources to develop our upscale store design. We have implemented a store design creating an atmosphere of sophistication and professionalism, yet happy, vibrant, and energetic while being comfortable and inviting. Before the very first Juice Heaven opened, we devoted extensive financial and human resources to research and development creating the highest standard of product quality. This was achieved by creating the perfect recipes and using the finest ingredients in the right proportions without compromising nutrition value. At Juice Heaven, we are continuously working on the development of new products. New recipes are carefully tested using the finest ingredients with different proportions until the highest standard of product quality is achieved. We are constantly searching for healthier bakery products, nutritional bars, chips, and other products to complement our delicious and nutritious smoothies and freshly squeezed juices. We have developed a systematic marketing program to advertise new Juice Heaven stores. This is accomplished with attention-getting, informative Grand Opening direct mail materials. Our in-store high quality graphics displays are designed to promote new products and seasonal campaigns. Our advertising fund is used to promote the Juice Heaven brand, new and seasonal products, and create awareness of new store openings. Our Franchisee Training Program is designed to systematically take a person that is not familiar with the juice bar industry and convert him/her to management personnel having the capabilities of running a successful operation. This is achieved through education and the duplication of the Juice Heaven operating system onto the franchised operation. Our education program consists of detailed discussions of the Operating Manual and Company Policy Handbook, hands-on training at a Juice Heaven store, field support including initial store opening and as much continued on-going support as necessary.